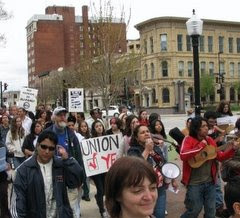 Here's a photo of Tom marching yesterday in the May Day Rally in downtown Madison. He's the one to the left of the "Union Yes" sign, appropriately enough, with the beard and cap. Tonight we're going to the May Day Sing-Along with Vicki Guzman. Nothing we'd rather sing right now than "Oh, you can't scare me, I'm stickin' to the union..."